CORPORATE BRANDING — DEMAND NATIONMADE! CUSTOM HANGTAGS WITH SPECIAL PANTONE GOLD INK AND ANTIQUE BRASS EYELETS. APPLIED WITH ROPE CORD. Your corporate gifts and identity products for your staff and clients should be as good as the company these items represent. We work with brands to outline the categories of product that best represent them as a company and help to design and merchandise around these tenets. CASE STUDY: Crispin Porter + Bogusky "Aircraft Carrier"
Each year CP+B gives a premium gift to their staff and key clients and Nationmade was selected for the 2016 holiday season. 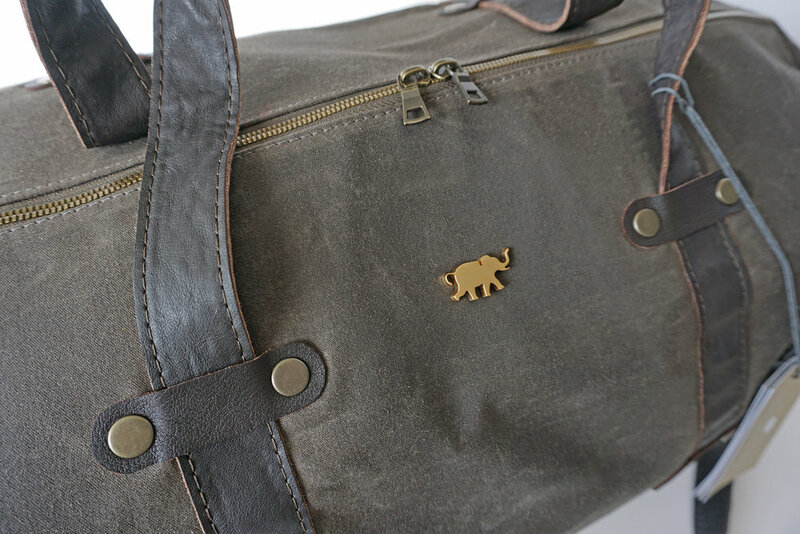 Working with Ralph Watson (VP, Chief Creative Officer), we helped to refine the design of a premium duffel bag as the gift. 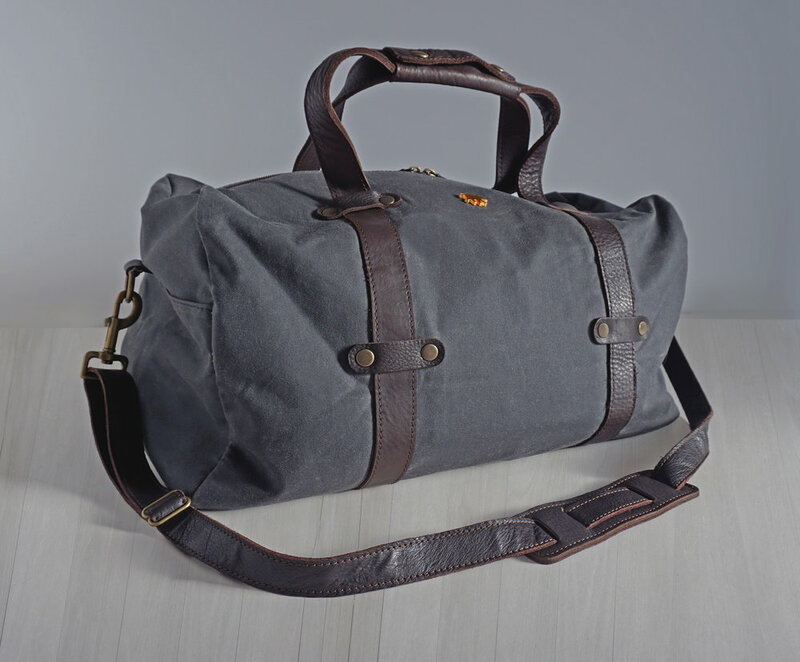 Working from an initial sketch, Nationmade sourced the fabrics (virgin wool, oiled canvas, handbag-grade leather), created prototypes for review and finally mass-produced and shipped the duffels worldwide for a simultaneous reveal. Some of the key color standards for this project were gold (with an actual one-ounce gold bar as the color standard) and Rubia which we pulled into the linings. In order to accurately reflect the true gold color, Nationmade had badges laser cut from stainless steel and 24-carat gold plated. The lining print called for mixing 24-carat gold powder (used for making gold leaf) into the printing ink. 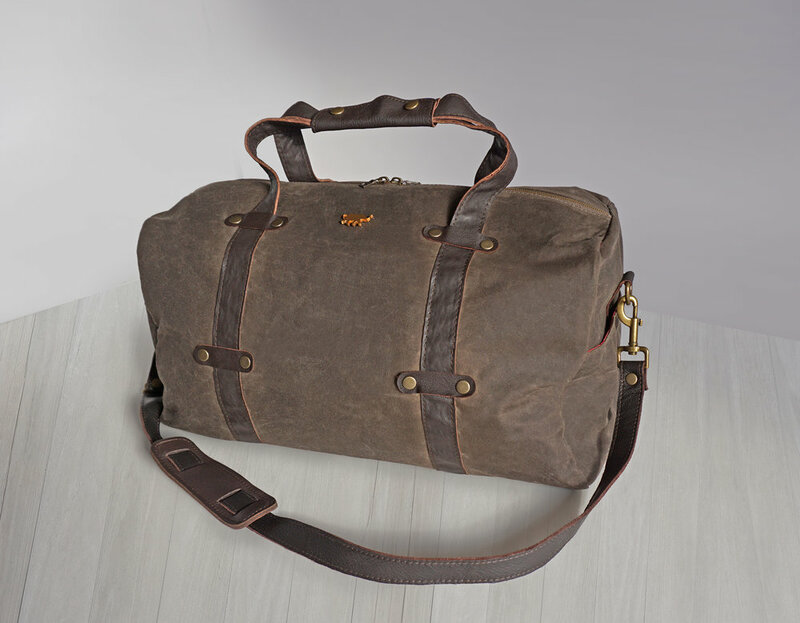 The duffels are made from Virgin Canadian wool and US-made Oiled Canvas. The leather was sourced in Napa, CA. The metal badge was cut in Denver and gold plated in Albuquerque. 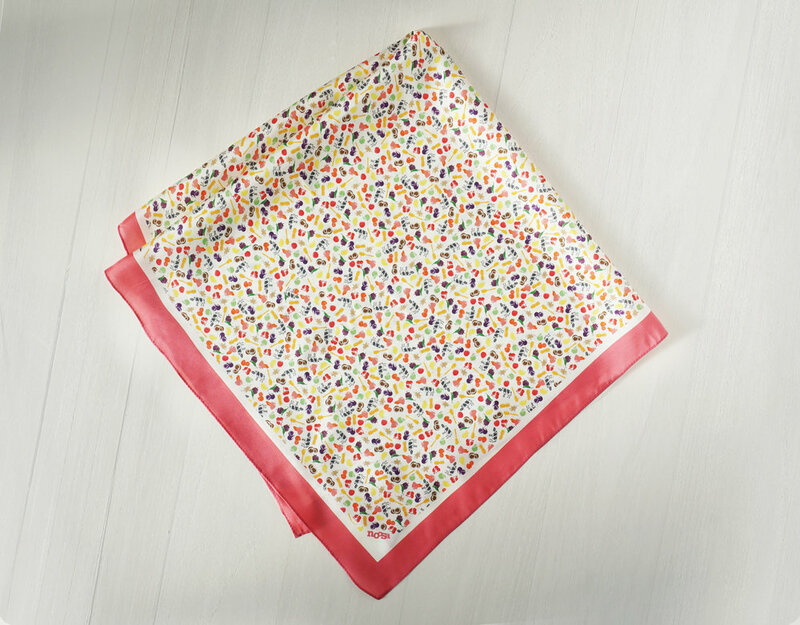 The satin lining was sourced in Los Angeles and printed in downtown LA. The metallic gold hangtags were printed in Lafayette CO.
CASE STUDY: Noosa Colorado theme. 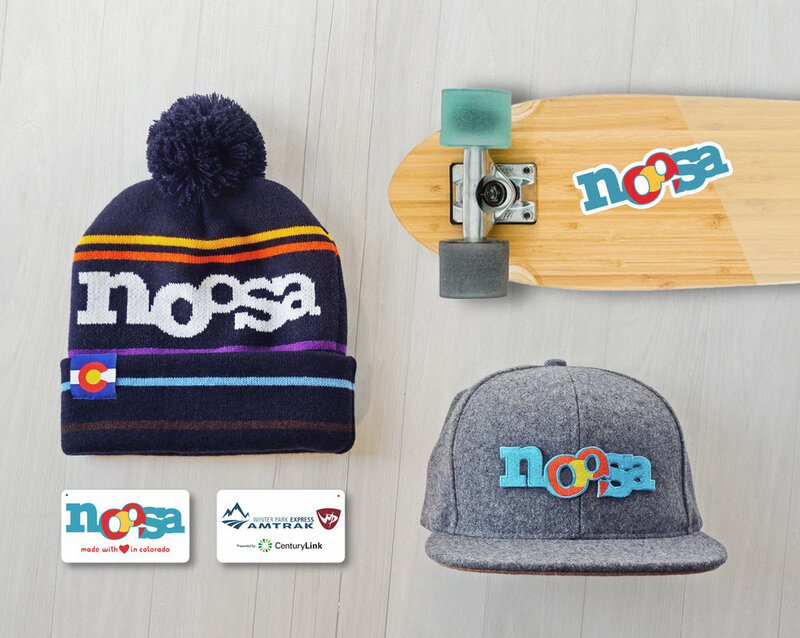 Noosa Yoghurt is a fast-growing brand in the natural foods business, and is based in Colorado. 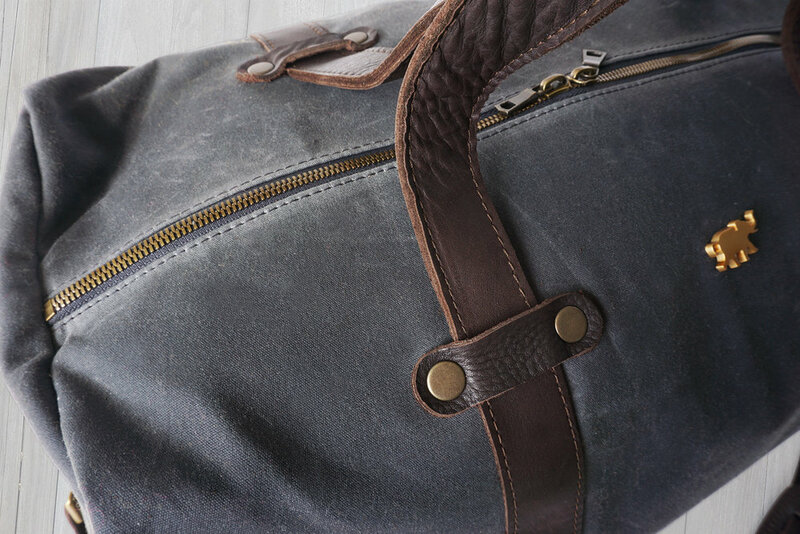 Nationmade has assisted the brand in creating a Colorado-centric strategy for it's promotional product and has developed accessories for distribution at ski resorts, the ski train among other events. Shown above are the logo knit hat (made in New Jersey), melton wool baseball cap with embroidered patch (made in Los Angeles), hangtags (made in Lafayette CO) and board sticker (made in Denver). CASE STUDY: Noosa Gold theme. For brand ambassadors and influencers. 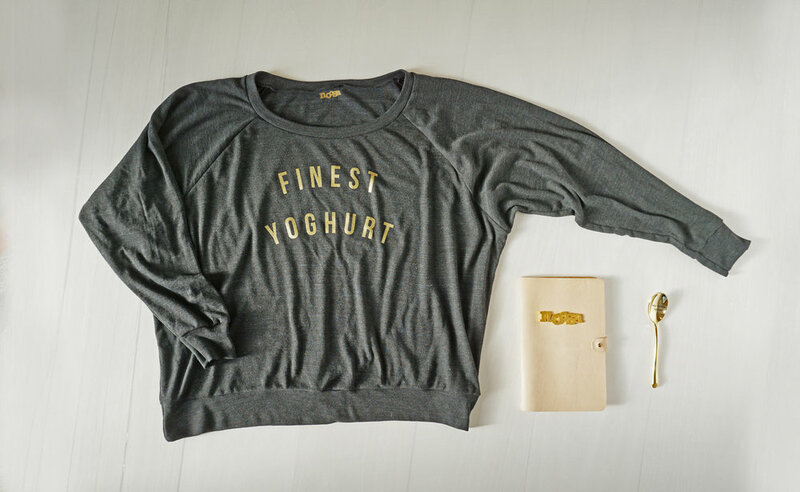 Shown above are the Tri-blend sweatshirt with metallic gold printing, laser-cut leather notebook cover with perfect bound inner notebook, and 24c gold spoon with laser-engraved "my noosa spoon" text. 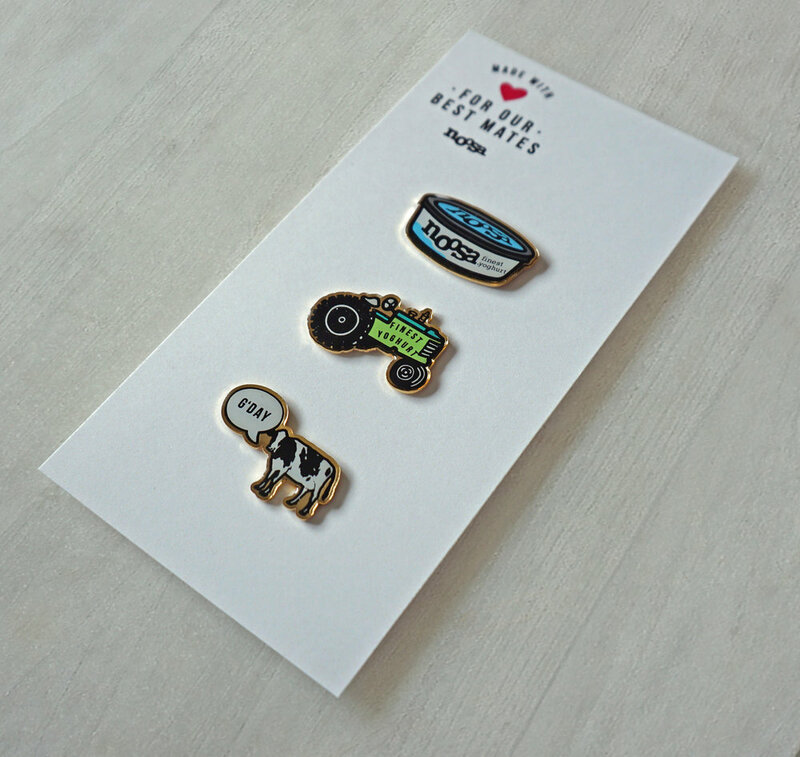 Assorted lapel pins with magnetic closure and a mix of 24-carat gold/enamel finish. 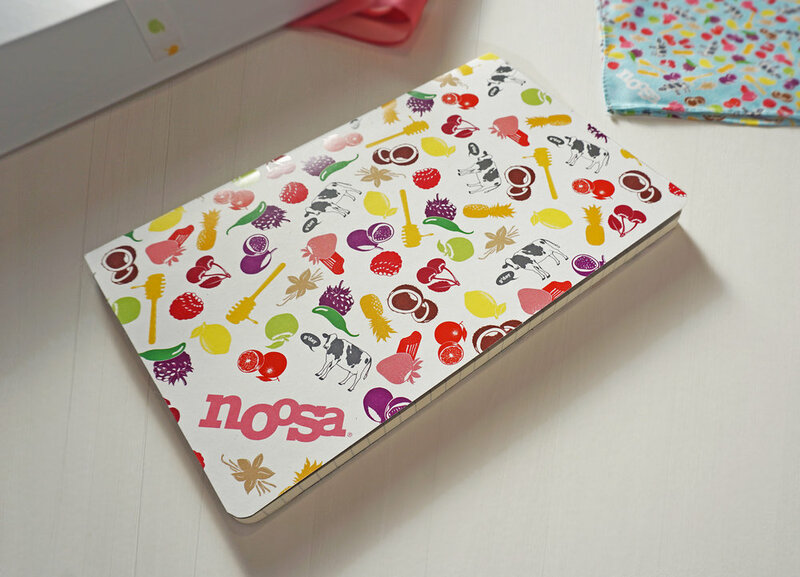 CASE STUDY: Noosa "Fruits" theme. Nationmade executed the logo repeat using the symbols from the lids of Noosa packaging. 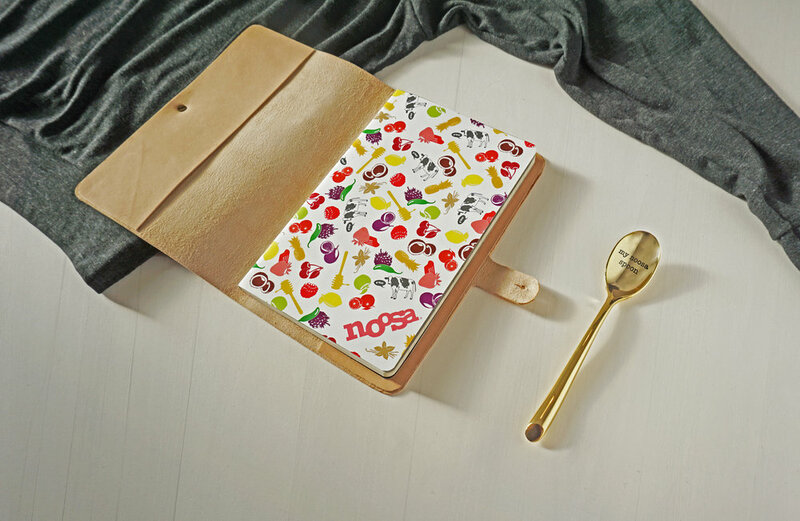 This repeat was used to create a 100% pure silk scarf and pocket square (made in San Francisco, CA), perfect bound notebook (made in Lafayette CO), and a box with custom-made ribbon tape and Noosa dipper sticker. CASE STUDY: WOOL CAPS. Custom-made Virgin wool caps, custom-printed satin linings. "Sam Browne" style closure back, custom 24carat gold "Hermy" emblem. Hat made in Los Angeles, CA. and the gold pin was finished in Albuquerque, NM.